Yesterday morning I spent ninety minutes in my LYS. By myself. It may be that only those of you with young children (or those who remember such a time) will fully appreciate the magnitude of this. It was truly a little bit of heaven. I wandered, I browsed, I socialized with many, many skeins of yarn--and all of this without interruptions. And, as a bonus, instead of listening to Dan Zanes & Friends in the car, I got to listen to a "grown-up book" on CD for thirty minutes on the way there, and for another thirty minutes on the way home. While drinking coffee that was still hot. Oh, it was truly a lovely, lovely morning. Only, ninety minutes really isn't enough time, especially when you are wandering through the Webs warehouse and dreaming of all the things you want to knit. Sigh. I didn't actually buy much, although I made a mental list of yarns that I would like to get to know better. It was fun to browse and to check out yarns that I have read about on other blogs. I fell in love with the baskets/bags from Lantern Moon, particularly these and the Tiny Totes, so they may go on my birthday wish list. 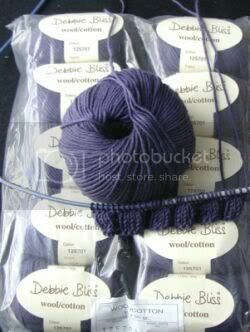 What I actually bought was some close-out yarn: Debbie Bliss wool/cotton (a 50/50 blend) to make the Graduated Rib Top. I even cast on a swatch when I got home. I love knitting with this yarn, but I am afraid that it may be too loose/drapey at the recommended gauge for the sweater; we'll see what I think when the swatch is finished & washed. And look what jumped into my shopping basket. Can you believe the unmitigated gall of this yarn, demanding that I bring it home with me even after this post? Somehow these two wily skeins convinced me that, even though I don't love knitting socks, I really do love wearing them, and that they would be perfect as a portable project to leave in the car for those Unexpected Pockets of Knitting Time. 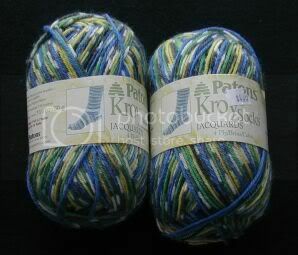 They argued that they could help me out by adding just enough to my yarn purchase to qualify for the Webs discount. Clearly, they had my best interests at heart; how could I leave them behind?